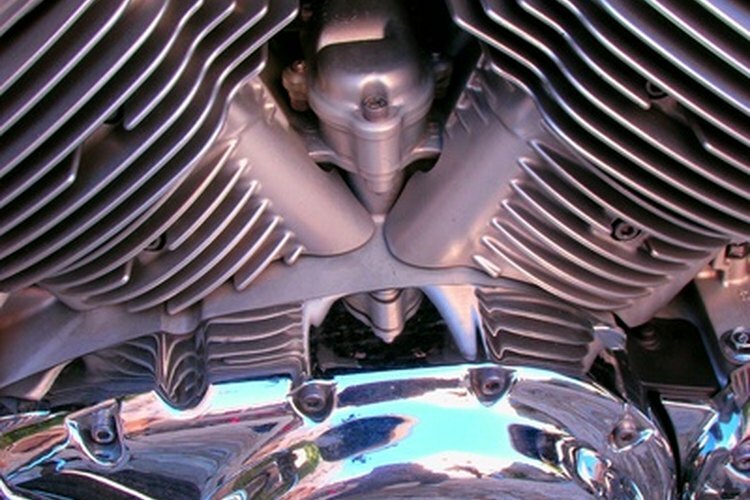 The V-Twin design has both rocker blocks set a 45-degree angle. The 1200cc Evolution was released by Harley-Davidson in 1984 as a replacement for the Shovelhead engine and rescue the company from the brink of bankruptcy. In 1986, the Evolution became the standard engine on the 1200 Sportster, replacing the Ironhead. Nicknamed "Blockheads," the Evolution can be identified visually thanks to its square rocker block design. The 1200 is a V-Twin, air-cooled two-cylinder engine with a displacement of 1201 cubic centimeter, a cylinder bore of 3.5 inches and a stroke of 3.812 inches. The four-stroke engine has two valves per cylinder, and an overhead-valve (OHV) configuration. The newest 1200cc "Evo's" are fuel-injected, with the manufacturer recommending the use of premium fuel only. The engine's power is transmitted to the pavement through a five-speed gear box, with top speed of 120mph. The 1200cc has a fuel economy of 42 mpg in the city and 57 mpg on the highway. Out of the factory, the 1200cc has a torque rating of 72 ft.-lb. at 4,000 rpm. Anyone who is interested in purchasing the Sportster 1200 should realize that this engine is designed for cruising, not for performance. "Out of the box," the horsepower rating on the V-twin 1200 is 66, placing it in the "cruiser" category. With a list of aftermarket parts supplied primarily by third-party manufacturers such as Delkron, Simms and S&S, the 1200 Evolution has the ability to transform from a 66-horsepower cruiser to a high-performance 120-horsepower machine. Although it ranks fourth in displacement size, after the 1340-, 1450-, and 1584-cubic-centimeter engines, the smaller engine size provides for a higher rpm range, reduced weight and better acceleration capabilities.